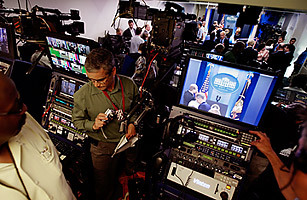 A view of the White House press briefing room from behind the TV cameras. On the Fourth of July, 2004, the daily newspaper of Lexington, Ky., issued an unusual correction. "It has come to the editor's attention," the notice began, "that the Herald-Leader neglected to cover the civil rights movement. We regret the omission." What I relish about this "correction"  which appeared on the front page and continued for 2,000 words  is how concisely it illustrates two fundamental problems of journalism. First, sometimes, we get the story wrong in ways so sweeping and consequential that they laughably exceed the capacity of the errata section. Second, we don't have effective tools for dealing with these large-scale mistakes. I regret the omission  and, given the high stakes of journalism, you probably should, too. True, unlike surgeons, we reporters can't cut off the wrong limb. But we can help cut desperate people off from assistance, as we did when false reports of mayhem in post-Katrina New Orleans prevented rescue workers from providing timely aid. True, unlike pilots, our mistakes can't bring down a plane  but they can cost someone their job (see: Shirley Sherrod) or help bring on an unnecessary war (see: Iraq). Given such potentially grave consequences, why isn't journalism better at understanding and acknowledging our errors? One answer is that the way we think about mistakes is, itself, mistaken. Most of us assume that serious errors are rare, that truly bad mistakes are committed only by truly bad or inept people, and that most mistakes are the product of individual rather than systemic causes. All three assumptions are wrong. Reporters make serious mistakes routinely, and we do so not because we are immoral, but because of the nature of journalism, and of the human mind. Consider two rich sources of error. The first is the echo-chamber effect. Scientists replicate one another's experiments in order to verify or disprove their findings. Journalists, by contrast, often just replicate one another's conclusions. That goes some way toward explaining how the massive myth of Pfc. Jessica Lynch's Iraq heroics grew out of a single inaccurate story in the Washington Post. The second is the double whammy of journalism's shrinking profit margin and growing news hole. Thoroughly investigating a story takes time and money, but reporters increasingly resemble doctors in an understaffed emergency room, working under immense time pressure with inadequate resources. Those conditions are not exactly conducive to the stodgy, time-consuming business of accuracy: verifying quotes, contacting additional sources, fact-checking claims. To these journalism-specific problems, we could add a whole series of species-wide foibles, whose effects can be pernicious in our line of work. One is the phenomenon known as confirmation bias: the tendency to seek out and emphasize evidence that supports our beliefs, while ignoring or discounting potential counterevidence. The sociologist Charles Tilly captured the workings of confirmation bias in the journalist nicely, when he observed that reporters don't contact sources looking for information, but rather for "rhetorical assistance,"  as he put it, "a quotable bit that will reinforce the point they already want to make." Nor are we journalists immune to all the other forms of bias. Think again of the quasi-hysterical coverage of Katrina: the uncritical regurgitation by reporters of claims of mass murder, children being raped, gang wars in the Superdome. Those claims proved hyperbolic to the point of sheer invention: according to journalist W. Joseph Campbell in Getting It Wrong, only six people died in the Superdome (four of natural causes, one of a drug overdose, one an apparent suicide), and not a single claim of sexual assault was ever substantiated. To the observation that these reports would not have flourished in the same fashion if the catastrophe had struck a middle-class white population, Washington Post columnist Donna Britt put it best: "No kidding." Are journalists simply destined to get it wrong? Well, yes  but not as often or as gravely as we currently do. Our mistakes have specific causes, and we could develop specific tools to prevent them. Like the surgeon and author Atul Gawande, journalist Craig Silverman (Regret the Error) is an advocate of checklists, which (as airline pilots and grocery shoppers know) are an effective way of warding off certain mistakes. Another tool, arguably the most crucial of all, is simply skepticism. As Bill Kovach and Tim Rosenstiel wrote in The Elements of Journalism, reporting is fundamentally "a discipline of verification." The one question we are most obliged to ask  of our sources and of ourselves  is: How do you know? Still, given the inevitability of error, the ability to prevent mistakes must be matched by the ability to acknowledge and correct them  not a half-century later, like the Herald-Leader, but rapidly and sincerely. That calls for a new attitude: an understanding that the shame doesn't lie in the mistakes, but in their silent perpetuation. In that respect, readers might be ahead of journalists. A 1998 study by the American Society of News Editors found that 63 of respondents were reassured rather than dismayed by the presence of corrections. "Readers don't expect perfection," Silverman says. "They expect us to work hard to prevent errors, and to correct any that occur." The point isn't to be perfect. If that's our goal, we'll fail every time. The point is to get better: not just better at being right, but better at being wrong.